The topic of this conference is the search for solutions to some of the world’s many “frozen conflicts.” My argument, however, is that in some cases a frozen conflict is precisely what we want, since the alternatives are often worse. 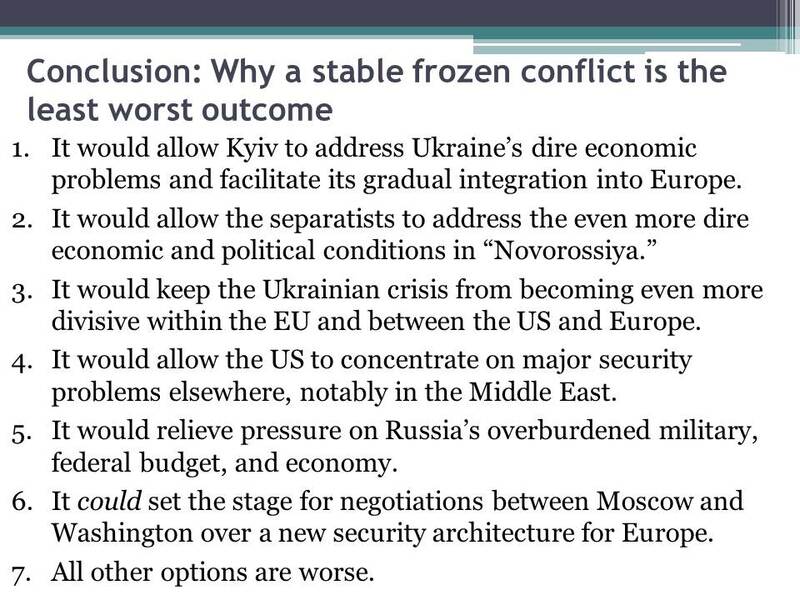 If so, the challenge is how to get a frozen conflict, not how to overcome one. That, I will argue, is precisely where we are in eastern Ukraine, where the West, Kyiv, and indeed Moscow should be pressing hard to turn what has been a hot conflict into a frozen one. Before I explain why, a quick word on the term “frozen conflict.” The noun “conflict” is pretty clear, but the modifier “frozen” can mean “not hot,” as in very limited or no violence, or “congealed,” as in long-lasting and unlikely to be resolved soon, if ever. I use the term to mean both, so a frozen conflict is both “not hot” as well as “long lasting,” either in the sense that it has already been with us for a long time and/or is likely to be with us for years to come. The question, then, is, are we going to get a frozen conflict in eastern Ukraine, and if not, what are the alternatives? As I see it, there are at least six possible outcomes for eastern Ukraine by year’s end, three of which will not produce frozen conflict, and three of which will. I list these six, going from the less probable to the more probable, and give you my take on the likelihood of each, in the Slide 1. The first possibility is full implementation of the Minsk II agreement. For reasons I will spell out in a moment, I think the likelihood of that is extremely low. 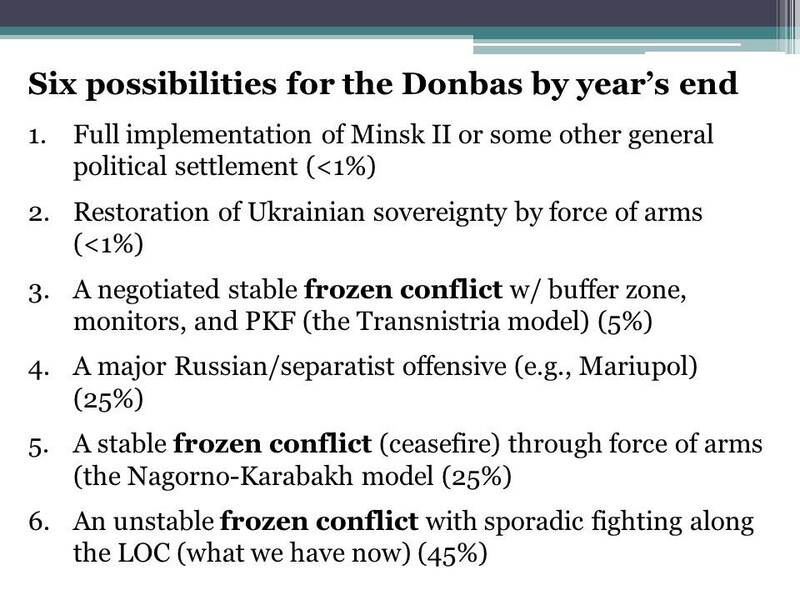 I almost never say something has a zero chance of happening, so suffice it to say I think the probability that Minsk II will be implemented in full is less than one percent. Next is the restoration of Kyiv’s sovereignty over the breakaway region by force of arms. Again, I view that as extremely unlikely, so less than one percent. I don’t believe Kyiv has the hard power to defeat the separatists and their Russian backers in eastern Ukraine for the foreseeable future, and I should perhaps add that doing so would truly be a poison pill for Kyiv, given the political and economic costs of trying to reintegrate a heavily militarized, hostile, and economically devastated region back into Ukraine proper. Third is what I call the “Transnistria option” – that is, a stable frozen conflict with a separation of forces (not just heavy weapons) and a buffer zone that is patrolled by armed international peacekeepers. I have been arguing for some time that I think this is the least-worst option for all parties to the conflict, but I don’t see the political will in Washington, the EU, Moscow, or Kyiv to make that happen, so I put its likelihood at only five percent by year’s end. Although I should perhaps add that the odds will go up if we are talking further down the road – say, 18 months to two years. Fourth is a major separatist or Russian offensive to take significant additional territory beyond a few kilometers from the current line of contact (LOC). That includes a possible assault on Mariupol, a medium-sized city on the Sea of Azoz with a pre-war population of around 500,000. If there were an assault on Mariupol, it would likely signal a Russian effort to establish a land bridge to Crimea. My assessment of the risk of a major separatist/Russian offensive – which I put at around 25% – is lower than that of many others. For example, the retired U.S. general and one-time NATO commander Wesley Clark gave a speech at the Atlantic Council in Washington recently in which he argued an assault on Mariupol in the coming month or so was extremely likely. I obviously don’t agree, in the first place because I think a successful assault on Mariupol is beyond the military capability of the separatists acting on their own. It would therefore require open Russian involvement, which I think Moscow does not want for both domestic and international/strategic reasons. Even with large-scale and open Russian involvement, I think an assault on Mariupol, or indeed on other significant urban areas in eastern Ukraine such as Kramatorsk or Slavyansk, would entail weeks and probably months of brutal urban warfare, and it would therefore be the best way to unite Europe and the Atlantic community, not divide it, which I think is currently the Kremlin’s primary strategic objective. The fifth possibility is what I call “the Nagorno-Karabakh model,” which is essentially a more-or-less stable frozen conflict brought about by force of arms – that is, where the combatants decide that the existing line of control is acceptable and agree to a ceasefire that lasts. In the eastern Ukraine case, this would presumably entail an ongoing OSCE monitoring mission to help prevent new rounds of fighting. The sixth possibility is an unstable frozen conflict but without major fighting or territorial losses by either side – so essentially more of what we have had in eastern Ukraine since the fall of Debaltseve. I think that is probably the most likely outcome, and I put its probability at 45%. Before turning to why I think Minsk II is not going to be implemented in full, let me show you the following slide to convey what I mean by the Transnistria model. 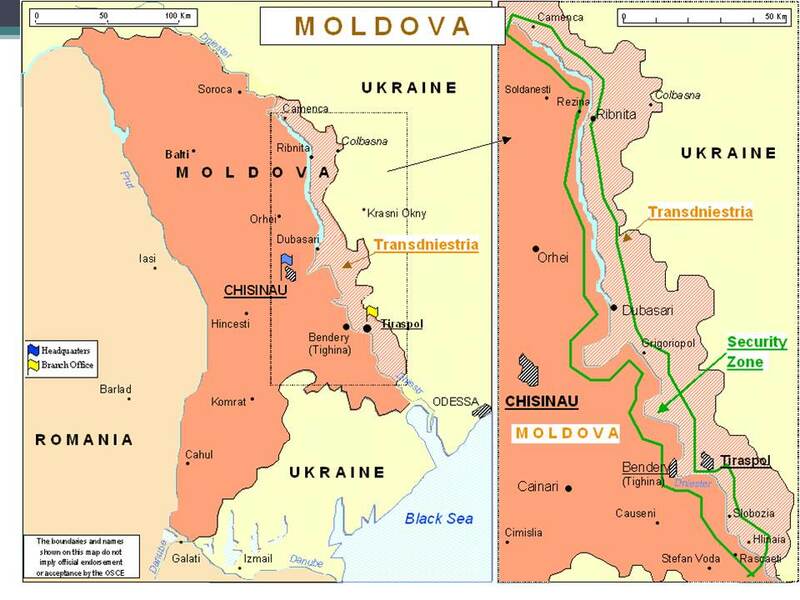 As you can see, Transnistria is a narrow slice of what the international community recognizes as part of Moldova, the great bulk of which lies to the east of the Dniester River and borders on Ukraine to the east. It is also, like the Donbas, an area where Russian is the predominant language at home and in public, and it shares a lot of other characteristics with eastern Ukraine as well. After the brief but bloody conflict between the Moldovan central authorities and Transnistrian separatists after the Soviet collapse, a ceasefire was agreed to in 1994 that entailed a separation of forces and a security zone, as you can see from the map, which has been patrolled by an armed peacekeeping force of 400 Russians and roughly the same number of Moldovan and Transnistrian soldiers (as well as a handful of Ukrainians). 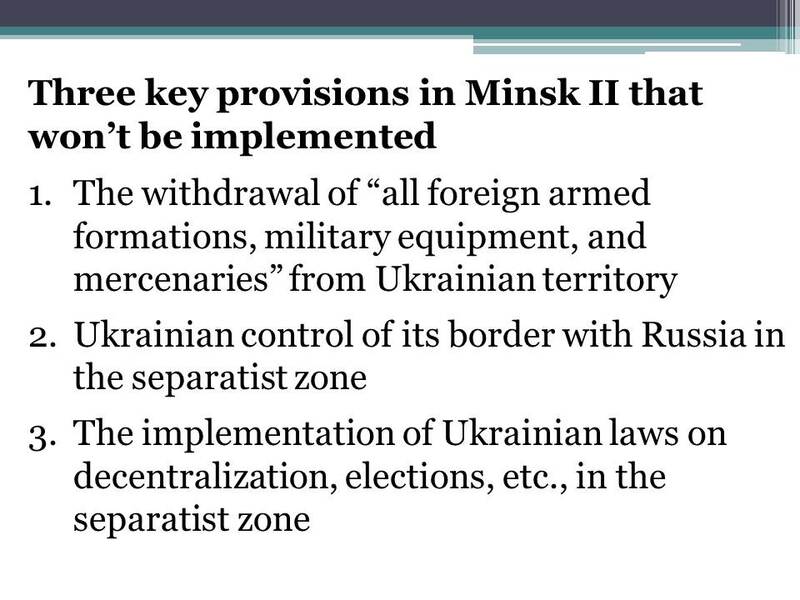 Regarding Minsk II, there are three key provisions of the agreement that I think might be implemented, as shown in Slide 3. These are the ceasefire provision, the separation of forces provision (which is unfortunately limited to various classes of heavy weapons only), and the monitoring of the ceasefire and force dispositions by the OSCE’s Special Monitoring Mission (SMM). I should probably add that it is also possible that we will eventually get a full exchange of prisoners, which is also called for in Minsk II, and where there has been some progress to date. There are, however, at least three key provisions that I think have almost no chance of being implemented, as shown in Slide 4. These are the provisions calling for the full withdrawal of “all foreign armed formations, military equipment, and mercenaries from Ukrainian territory;” Ukrainian control of its border with Russia in the separatist zone; and any kind of de facto sovereignty for Kyiv in separatist controlled territory, including laws on elections, the powers of regional and local governments, and so on. If I am right, and Minsk II has almost no chance of being fully implemented, then statements from political authorities in Kyiv, Moscow, the West, or indeed anywhere that peace – or the lifting of Western sanctions on Russia or French delivery of its Mistral-class amphibious assault ships to Russia – is contingent upon full implementation of Minsk II should be taken with a large grain of salt, or at least put into perspective. 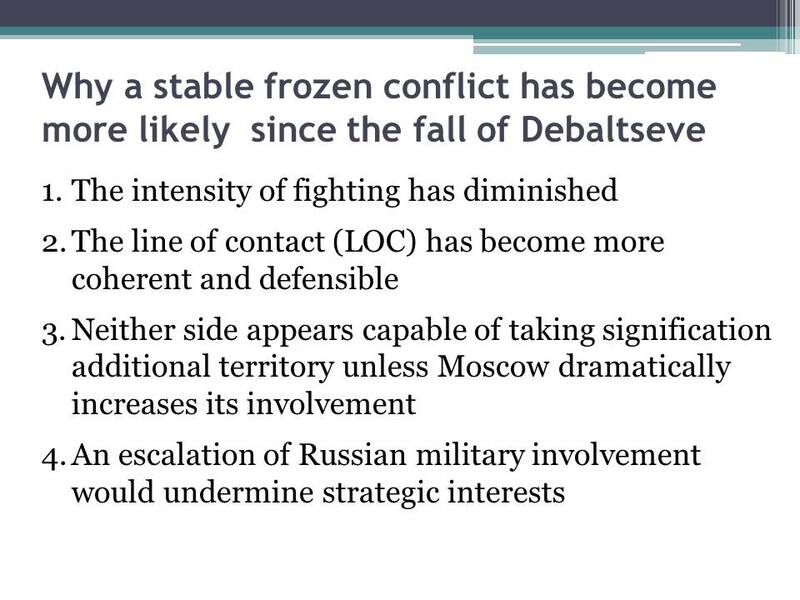 Nonetheless, the good news is that I think the likelihood that a stable frozen conflict will take hold in eastern Ukraine has increased significantly since the fall of Debaltseve, for at least the following reasons (see Slide 5): (1) the intensity of fighting has diminished; (2) the line of contact has become more coherent and defensible; (3) neither side seems capable of taking significant territory short of a major escalation by Moscow; and (4) a major escalation is not in Moscow’s strategic interest. 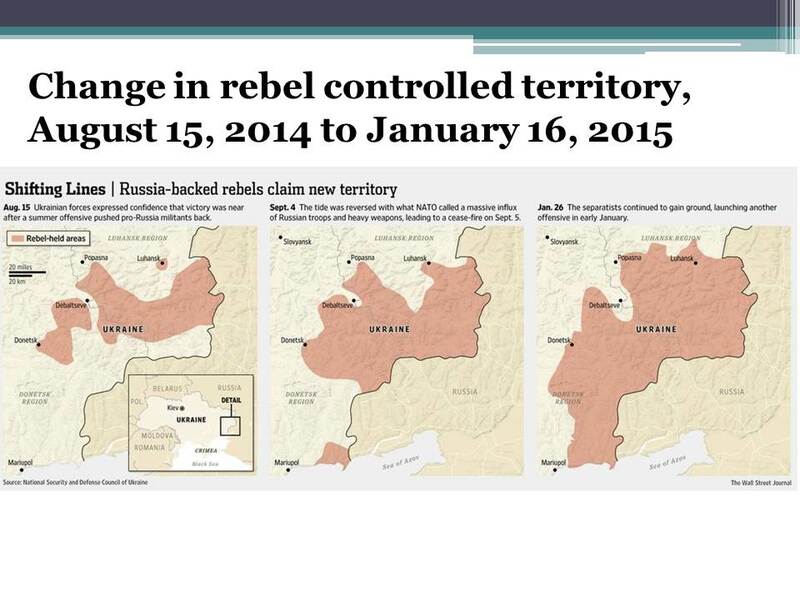 Regarding the line of contact, Slide 6 shows how the territory controlled by the separatists has expanded from last August, when Ukraine’s armed forces had pushed the separatists back into their strongholds in Donetsk and Luhansk and up to the border with Russia, until late January, a few weeks before Minsk II was signed. 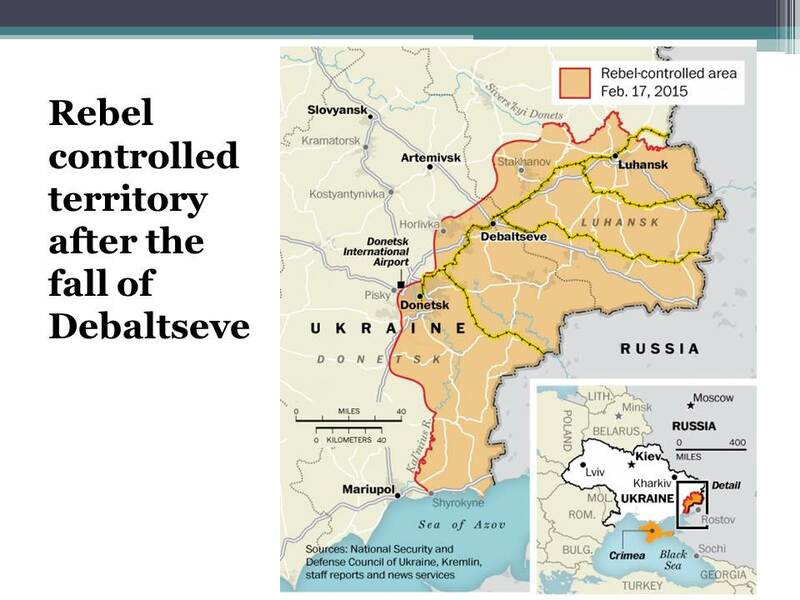 The right hand panel also shows the Debaltseve salient, which for obvious reasons was a problem for the separatists. Slide 8 shows the line of contact after the separatists drove the Ukrainians out of the salient, and it highlights the important railroad track between Luhansk and Donetsk. Finally, Slide 7 shows the restricted areas for various kinds of heavy weapons in the conflict zone. The important point here is that I doubt that either side is going to comply fully with these provisions unless we have another agreement on a full separation of forces, not just heavy weapons, because it will be very difficult for the SMM to monitor compliance, particularly in large urban areas. As a result, both sides are going to assume that the other is cheating, which will mean that they both will cheat. 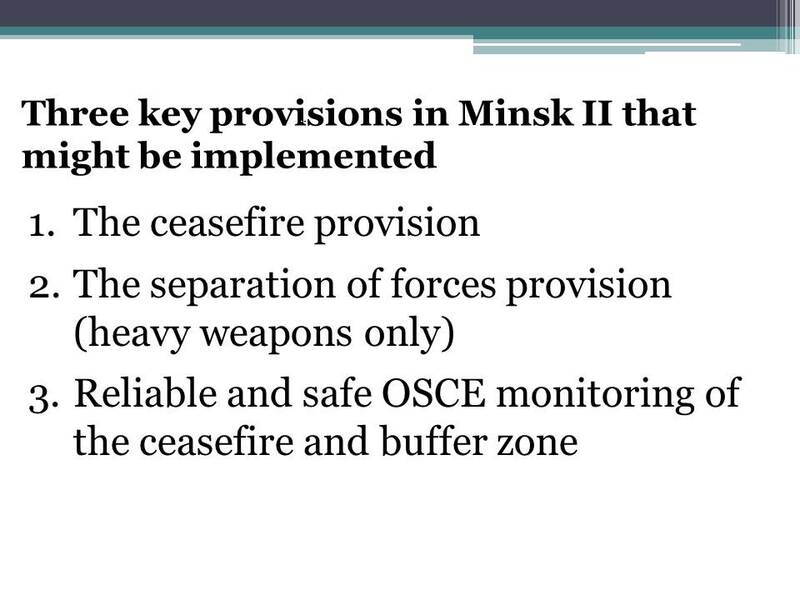 Still, even partial compliance with the heavy weapons withdrawal provisions in Minsk II increases the likelihood that a ceasefire will take hold and produce a stable frozen conflict. It would allow Kyiv to address Ukraine’s dire economic problems and facilitate its gradual integration into Europe. It would keep the Ukrainian crisis from becoming even more divisive within the EU and between the US and Europe. It would allow the US to concentrate on major security problems elsewhere, notably in the Middle East and East Asia. It would relieve pressure on Russia’s overburdened military, federal budget, and economy. Most importantly, it could set the stage – eventually – for negotiations between Moscow and Washington over a new security architecture for Europe that would turn what is now a zero-sum game into a positive-sum one, including for Ukraine. All other alternatives are worse.